Rule #1 for a bike trip – Expect the Unexpected. 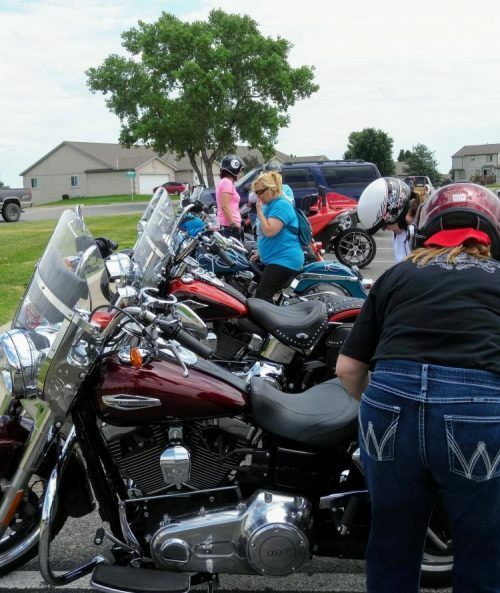 On June 25th, twelve Kitties piled into the Quik Trip parking lot on the northwest part of Wichita all ready to ride to Wilson, KS and eat at the Made from Scratch Café. As I was walking out of the QT with my cup of hot tea, I was accosted by Kitties who all had their radar pulled up on their phones. What I saw was a whole lot of blue, green, red and yellow and it was the red and yellow that gave me the most concern. And where should all that blue, green, red and yellow be? Right smack dab in the middle of where we were headed. If we didn’t get wet getting there, we sure as heck were going to get wet getting out of there. With imploring eyes, I heard one Kitty after another say, “Please Janice, don’t make us go there. We don’t want, need or can survive another Oh Hail No ride!” Ok Kitties, where do you want to go? From the radar, it appeared all the wet activity was north of us, so instead of being Kitties today, let’s be Snow Birds instead and head south. Suz suggested Attica, but the memory of the Oh Hail No ride is still too fresh so Attica was scratched. Kathryn suggested Winfield with a stop in Dexter to visit the Henry’s Candy Company. We all agreed that was doable and after Suz begged on her hands and knees that we NOT eat Mexican food (something about stomach cramps and diarrhea – Oh, was I not supposed to share that? My bad. ), we agreed that Montana Mike’s would have something for everyone and especially those with delicate tummies. So Kathryn, with the map of Kansas hard wired in her head (seriously, how is it that Kathryn knows every single back road in the state of Kansas and I have to Mapquest how to get across town? ), she quickly rerouted us from northwest Wichita to southeast Kansas. However, before leaving we all welcomed Sue, who was making her debut ride, to the group. Let me just say that this is one Kolor Koordinated Kitty! Her bike is a beautiful teal color and she has embraced this color to the absolute max! Her shoes were teal, her Kitty shirt was teal, her jacket was teal and her little backpack was teal. She even has a daughter named Teala! We may not know a lot about Sue yet, but we sure as heck know her favorite color! With Kathryn in the lead and Nellie bringing up the rear, we were in Winfield in no time flat, despite a slight delay by a passing train. As we pulled into the parking lot of the restaurant, I didn’t see one single indication that this was Montana Mike’s. As we parked our bikes, I looked over at Colleen and said, “Where are we?” Her response, “Just outside of Winfield.” OK, I had that coming with my inability to lead myself out of a paper bag, but what I mean is what is this place? My little bandanaed head was spinning around looking for a sign that said Montana Mike’s, but it appeared we were eating at the Now Open Restaurant as that was the only sign in sight. Oh well, fine by me so long as it’s not Mexican food because if it is, I ain’t riding behind Suz! Turns out, Montana Mike’s had closed and it was under new ownership, but the signage hadn’t been installed yet. Despite the fact that 12 Snow Birds showed up unannounced and unprepared for, we were immediately seated and received excellent service from a super friendly young waitress. However, in spite of seeing 12 gorgeous bikes parked outside, she only commented on one. Nellie’s Whiz Bang machine. I swear, riding with Nellie is like being the ugly girl with a group of pretty girls in a bar. We are categorically ignored! Darn you Nellie and your Whiz Bang machine! You know how I like being the center of attention! You’re ruining everything! I conducted the normal Kitty business while waiting for our lunch to arrive by selling pins, patches, taking orders for Kitty swag and trying my best to keep track of all the cash that was being thrown my way. To an outsider, this must look like some serious drug dealing going down with all the trading of cash back and forth. After lunch, I counted out the 50/50 money and BAM! Someone is going home with 30 smackeroos! We gave Sue the honors of pulling the winning ticket and was it me? No. Again. The winning ticket belonged to SECOND TIME WINNER DAWN MORSE! I’m seriously thinking of changing the bylaws to say that no Kitty will be allowed to win twice until this Kitty is allowed to win just once! Congratulations to Dawn! Kinda. No seriously, I’m happy for you. Sorta. As we were wrapping up our meal, Kathryn announced that weather was moving into Hutchinson, where she lives, so she was going to make a run for it and try to beat the rain. Colleen, who was fighting a splitting headache, said she was going with her and Bobbie, who believes it’s better to travel in threes, said she was joining them, as well. So as those three Kitties headed north, nine Snow Birds stayed south and travelled the short distance to Dexter. But first, we made a gas stop at the very same Dillons where the Fob debacle happened last month. All eyes were on Christine to make darn sure she had her Fob and she secured her Fob! Upon arriving at the Henry’s Candy Company in Dexter, we all filed inside to buy as much candy as we could stuff in our saddle bags. Denise and Suz had their picture taken to commemorate a picture that had been taken there in 2014 to see if they had aged any – they have not. After paying for our goodies and taking a water break, we all biked up and said good-bye to our Snow Bird days and headed north to uncertain weather. Dawn led us back to Wichita via Augusta. So far so good, not a raindrop in sight. However, as we arrived in Augusta, I looked to the east and it didn’t look good. Not good at all. I looked over at Denise and said, “We’re going to get wet.” Well, not all of us, just those of us who live any further west than about Greenwich Road. Linda, Suz and Nellie made it home high and dry. Dawn got a little wet, but the rest of us? Soaked. To. The. Bone! None of us had rain suits on and only one of us even had a jacket on – that being Smarty Pants Denise. I debated pulling over to put on my jacket but it wasn’t a rain jacket so that just meant another piece of clothing would be drenched so I just trudged on. Christine found the silver lining to all those dark clouds and was grateful that the rain had cleaned off all the bugs from her half chaps. I, however, just longed for my Snow Bird days….. Thank you for another great day on the bikes! We reinforced what we already knew…it’s not where you go that matters. It’s who you go with that’s important! Those on board for the Scratching Made from Scratch Road Trip were Janice, Kathryn, Bobbie, Maureen, Christine, Denise, Colleen, Suz, Nellie, Linda, Dawn, and Sue.